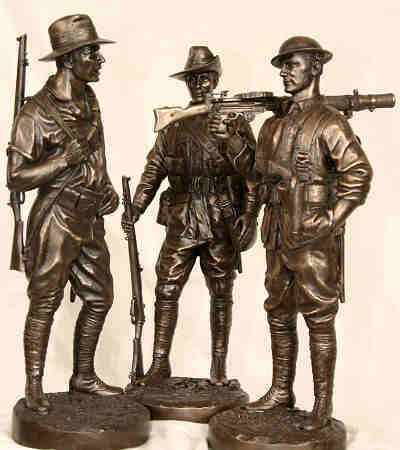 We all, as both collectors and historians, appreciate sculptures of men at war... fashioned bronze certainly has a classical appearance and feel. One cannot really savour statuettes unless your fingers touch the edges, feel the face or hold it in your palm and rotate slowly to inspect the fine detail of clothing, weapons and accoutrements. 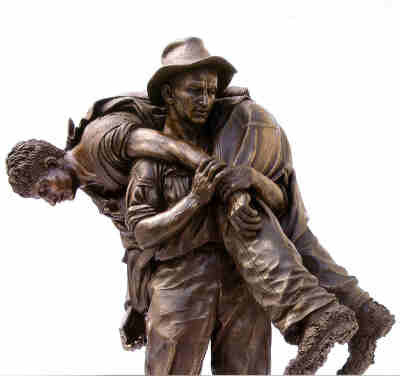 Our heritage is evident in bronze statue memorials in so many country town squares throughout Australia. There are many pleasures in owning and displaying such works of art, moments of military history captured in metal. * Pride in correct detail as firearms collectors know intimately each part and fitting on particular marks and models. * Edged weapons enthusiasts similarly appreciate correct detail of a naked blade or worn scabbard locket. * Webbing collectors know if a buckle or seam is out of place, the pattern or webbing of the correct pattern. * Uniform fans recognize the appropriate colour patches and insignia, boot details and headgear technicalities. * Historical buffs consider the rolled up sleeves or spattered mud on boots or trousers, the frozen countenance. painter or model maker have the knowledge as we are all specialists in our own trades. * This is why the Naked Army figurines are so special, even in 1:6 scale or c.315mm tall. and passion immortalized as cold metal, and now available to us all. with bronze coating maintains the detail but reduces the cost and weight significantly. * Each statuette is hand finished and individually numbered, a guarantee of perfection and detail. Vietnam - 1ATF RAR Infantryman, 1967-68 with early L1A1, wooden carry handle, &c.
Vietnam - RAR Infantryman ca. 1969-70 with L1A1 later issue, plastic carry handle, &c.
SAS Operator - Iraq & Afghanistan 1007, with Colt M4 carbine & M205 launcher, body armour, &c.
For uniform, kit and weapons detail, go to www.naked-army.com site, click the products page, then select individual soldiers to view 360 degree angles of detail and quality. Personally, I am proud of the figures in my collection and they receive admirable comments from house guests and visitors. Don't delay, as some are out of stock already.